Today, the first specimen of our newest product offering came off the production line in France. The white 1.0-litre petrol 3-door Toyota Yaris opens a brand new chapter in our product line-up in Europe. 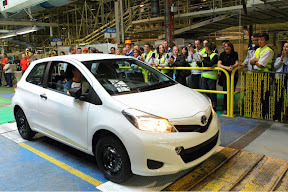 The third generation Yaris is also expected to continue the success of the model on the old continent. I can't wait to have a go in it and to play with the all new Toyota Touch multimedia navigation system!